Today’s word is 「婚カツ」（or 「婚活」＊）( = konkatsu). It is a very trendy word. Can you guess what it means? Remember that in modern Japanese, words tend to be abbreviated. Let’s break this word up and look at each part individually. 活動 = かつどう ( = katsudou) activities. So 「婚カツ」( = konkatsu) means “marriage partner hunting“ or “act of seriously and actively looking for a spouse“. = Genzai Maggie sensei wa konkatsu chuu desu. = Maggie-sensei is actively looking for a husband. = Maggie wa konkatsu ni isogashii. = Maggie is busy looking for a husband. What do they actually do for 婚カツ? ( = konkatsu) Some register at marriage service companies. Some go to matchmaking parties. This term became so popular that it was used as the name of a TV drama. 「離カツ」 ( = rikatsu) is from 「離婚活動」 ( = rikon katsudou) act of getting divorced. 「恋カツ」( = koikatsu) is from 「恋愛活動」 ( = ren-ai katsudou) act of looking for a boyfriend/girlfriend. = (To be honest I don’t want to marry an oldest son, but) I can’t be so choosy so I should compromise and marry an oldest son. Note: In Japanese society, women prefer to marry younger sons because it is less responsibility and they don’t have to live with their in-lows or take care of them. Older sons are often expected to look after their parents when they become elderly. 「長男」 ( = chounan）means the older son. 「次（or 二）男」 ( = jinan) is the second son. ( 「長女」choujo is the oldest daughter, 「次（or 二）女」( = jijo) is the second daughter.) The third one is called 「 三男」 ( = sannan) the third son or 「三女」( = sanjo ) the third daughter. When you have no choice, or you are very desperate, you just compromise. = Since I don’t have money so I could compromise and buy a small car. 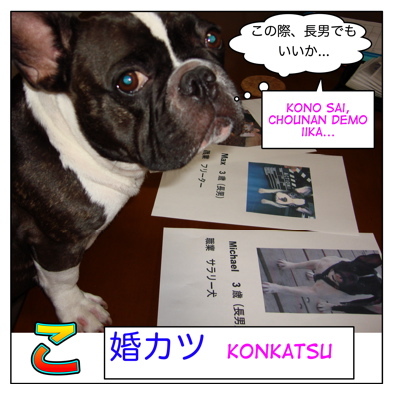 = kono sai 〜demo iidesu. = Mou hikouki ippai nandesuka? Kono sai, donna hikouki gaisha demo iidesu. = Kekkyoku Konkatsu yorimo jibun wo migaita houga yosasoune. = After all, I’d rather spend time improving myself instead of Konkatsu! ohhh that’s so different here, when parents are old they usually end up moving to a nursing home…. We do have lots of nursing homes as well. A lot of elder people prefer to live in their own house but when they get really old and they need special care=介護=kaigo, they decide to move there. It’s a tough decision. So, arasa means around thirty(araundo sa-tii?)? Now I understand why Arashi members said Arasa to Rida when he turns 30 that day. *im using my friend’s laptop so no japanese characters. so lazy to change the setting. That’s right. アラサー means around thirty アラフォー means around forty. Ueto Aya is cute! Just finish watching Konkatsu and I like it. You don’t have to settle! You’re super cuute! Hontoni sou omou? Really you think so? Just recently (last season) a quite funny j-dorama with ueto aya finished, called “konkatsu”. it’s a comedy/unrequited love drama with was actually quite fun to watch. Yes! You saw that drama? Ueto Aya-chan and Nakai-kun were in it. So if there are people who want to know more about “Konkatsu”, please watch that show. There is a tendency to make a TV drama using a new word lately. tass san, Thank for your information! Arigato! I never realized アラフォー meant around 40 since I always saw the drama’s name in english. That one was interesting. Amami Yuki-san played the role. Also I remember seeing a drama about woman who wanted to get married but she was 28 or something and everyone was like if you hit 28 then it’s almost hopeless to think to get married. So she didn’t want to reveal her age. I think it was in the late 90s or early 2000s. Yes, we have expressions like アラフォー (around forty) or アラサー(around thirty). And there used to be a trend which compared women with “Christmas cake” in old days. (You can’t sell Christmas cakes after December 25th. That means if your age gets the age 26, less people would be interested in you. That is awful isn’t it? But yes, things have changed since then.